It is a good day to dye! 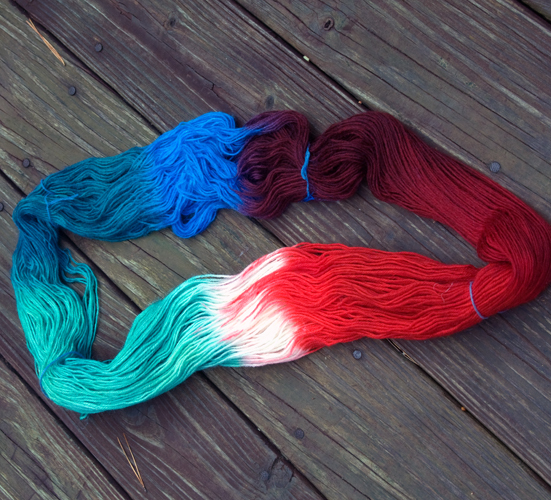 It is a good day to dye (not die)! 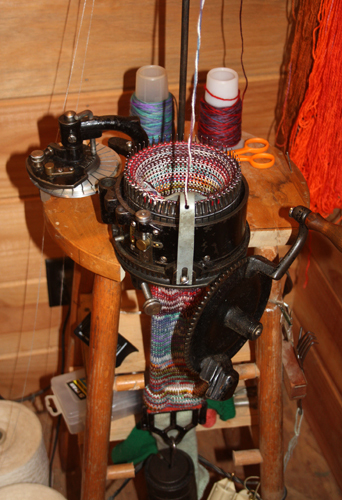 Although I spin my own Jacob Sheep fleeces into yarn for most of my yarn needs, I admit to getting just a bit carried away accumulating practice yarn for my antique CSM (circular sock machine) when I purchased it a few years ago. The beast has a huge learning curve and I didn’t want to learn using my handspun. Well, I learned before I used up my stash of practice yarns and went on to using my handspun. That is not really surprising as I got a little carried away snatching up beautiful yarn at good prices. I have some commercial yarn left. Much yarn. Lots of yarn. Lots and lots of yarn. Natural fibers (a collection of wool, silk, and cashmere), undyed, ready for the dye pot. Ready for many dye pots. Did I mention I got carried away? It’s winter. My feet are cold. I like color. My fiber room is overrun. It’s time to use up some of that stash. It is a good day to dye. Strong hearts, brave hearts to the front!Let’s get creative. 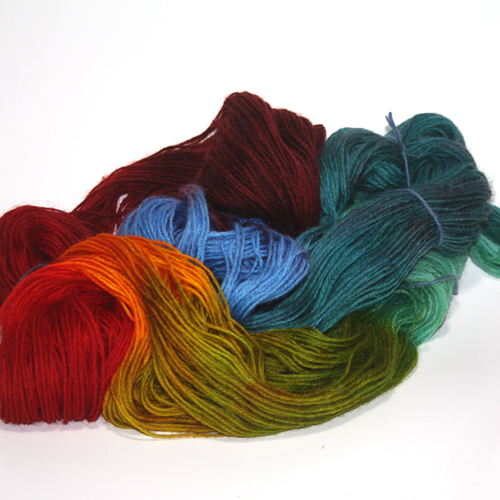 My favorite way to dye skeins is to dip dye, also called space dyeing. The yarn is first skeined. 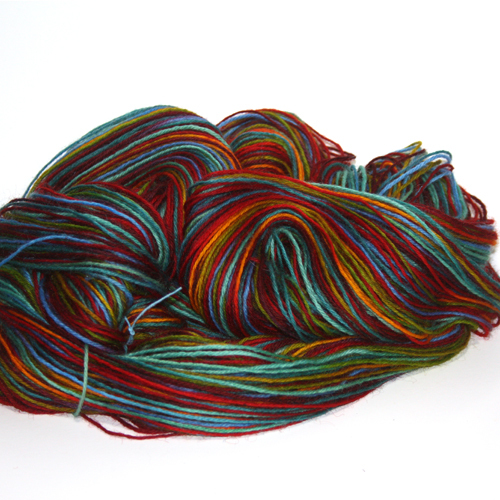 The size of the skein effects the dye pattern. 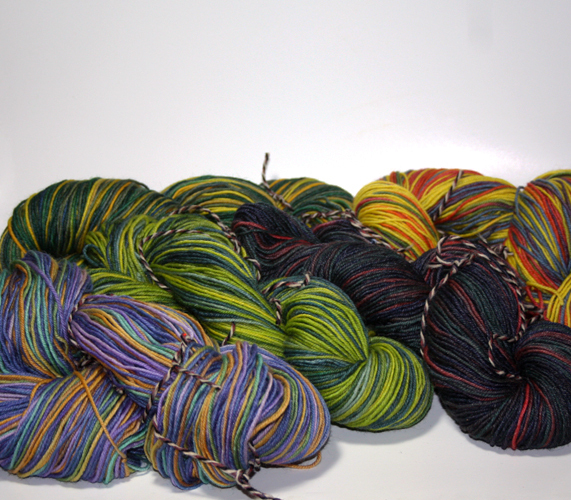 I generally skein in two yarn bouts as that is the most convenient for me. 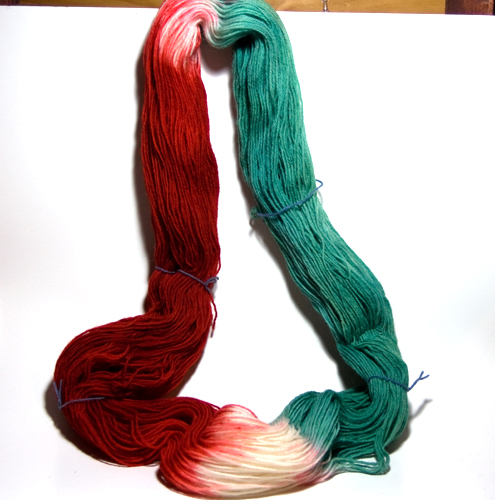 I often start with three dips, but this skein started with two dips – one Jade Green and one Turkey Red. 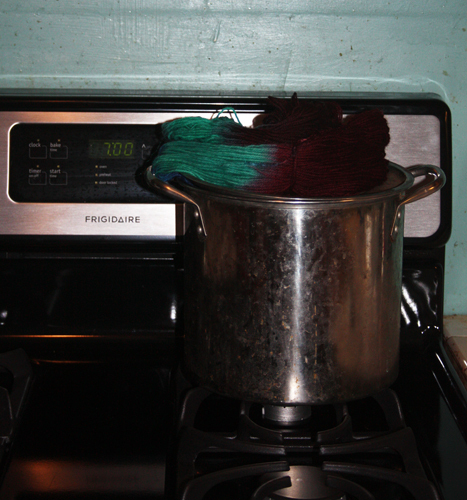 The yarn is partially submerged in a pot of dye and simmered for 30 minutes and left to cool. Each color addition requires another dip. Here’s the yarn with the third dip – Brilliant Blue. This adds three new colors – Brilliant Blue plus two overlaps. 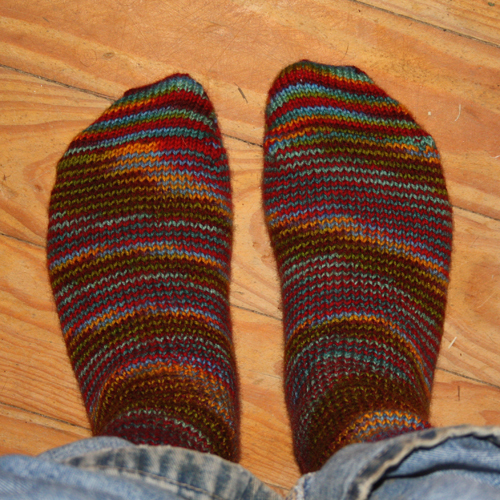 My feet are toasty and four ounces of my stash has moved from my fiber room to my sock drawer. Aside | This entry was posted in Fiber Happenings. Bookmark the permalink. 3 Responses to It is a good day to dye! Going to have to add another item to my bucket list, beautiful job. Wow, Linda – so neat to see the process of yarn to feet. And those socks are gorgeous!